David Bedford is considered one of the UK’s foremost composers and arrangers working both in the Classical and pop genre. He first came to the attention of the rock world as a member of Kevin Ayer’s band and the arranger of Kevin’s album Joy Of A Toy. He was also the arranger on an orchestral version of possibly one of the most famous albums ever, Mike Oldfield’s Tubular Bells. David has also worked with other artists, notably the Edgar Broughton Band and Roy Harper. His first proper solo album was Nurse’s Song With Elephants for John Peel’s Dandelion Records label in 1972. Further albums for the Virgin label followed including Star’s End and the Rime Of The Ancient Mariner. 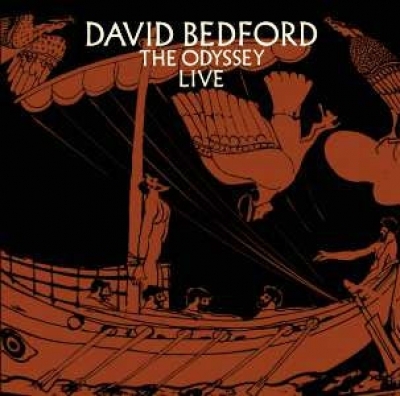 In 1976 David released The Odyssey, an album which was a musical setting for the play by Homer. This CD is from the one-off live performance of The Odyssey which took place at the Royal Albert Hall on the 25th of January 1977. It was a star studded affair and the performance featured amongst others Mike Ratledge (Soft Machine), Jon Lord (Deep Purple), Dave Stewart (Egg, National Health), Neal Ardley, Peter Lemer and Mike Oldfield. The performance also featured the Queen’s College Choir. A special programme was sold for the show which was also recorded for broadcast on commercial radio (in the London region only). The concert has never been heard since the original performance. I remember chasing the radio station up – Capital – who said they’d thrown out all tapes from this period, so we assume David himself kept a copy. It is the first time it has ever been issued on CD. Since the CD was issued earlier this year, David has died, aged 74. An obituary appears on the site. The CD can be ordered at DTB Online Store. Hi Simon, I remember ‘The Odyssey’ itself was aired on Capital Radio, but Jon’s wasn’t? Is your tape an audience recording then? I was there! A pity Jon’s set hasn’t survived, I remember it was a couple of selections from ‘Sarabande’ ? Plus one other? Can anyone confirm his set? It was a lengthy chunk from Sarabande; I have a cassette somewhere…! Pull that tape out and release it! You know we’ll buy it.